I love salmon, but unfortunately the other half does not, and because it was on special I went for Venison rather than the alternative Beef Wellington. I topped mine with a set of holly leaves and berries for the festive touch. 1. To make the crepes, whizz the flour, egg and milk with a pinch of salt in a blender or processor until smooth. Pour into a jug and stir in the herbs and some seasoning. Leave to rest. 2. Fry the mushrooms in a little oil until they give up all their moisture and it has evaporated, leaving you with a thick paste. Add the thyme leaves and some seasoning and keep cooking for a few minutes. Cool. 3. Stir the melted butter into the crepe batter, heat a 15 cm crepe pan and oil it lightly. Pour in enough batter to make a thin layer on the base of the pan, cook until the top surface sets and then turn over and cook briefly. Remove and repeat with the rest of the batter. This will make a couple more than you need so choose the thinnest ones for the recipe. 4. Sear the beef all over in a little oil in a very hot pan. Brush with the mustard, season and allow to cool. 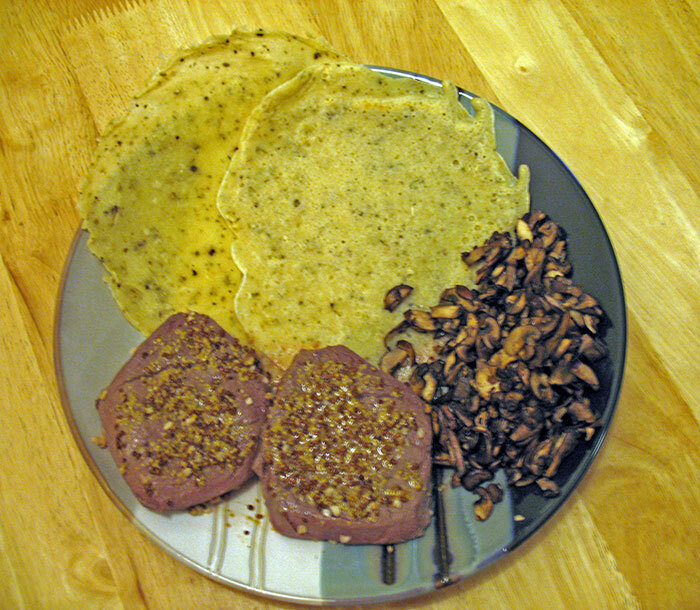 Clockwise: The crepes, mushroom paste, and browned Venison steaks (I couldn’t get fillet). 5. Lay a large sheet of cling-film on a kitchen surface and put two crepes down on it, overlapping a little. Lay over the parmaham (prosciutto). Spread the mushroom mixture over the ham and put the beef in the centre. Roll the cling-film up, taking the crepe with it, to wrap the beef completely into a nice neat log. Chill for 1 hour. 6. Heat the oven to 200°C/390F. Roll out the pastry, remove the clingfilm and wrap the beef in the pastry like a parcel, with the ends tucked under. Trim to keep it nice and neat. Brush with egg, score with shallow lines across the top and chill for 20 minutes. 7. Cook for 20 minutes. The best way to test if the meat is done to your liking is to neatly and carefully stick a skewer into the beef, count to three and then test it against your inner wrist. If it is cold, the beef will be raw, if it is warm then the beef will be rare and if it’s hot, it’ll be cooked through. Leave to rest for 20 minutes before carving. 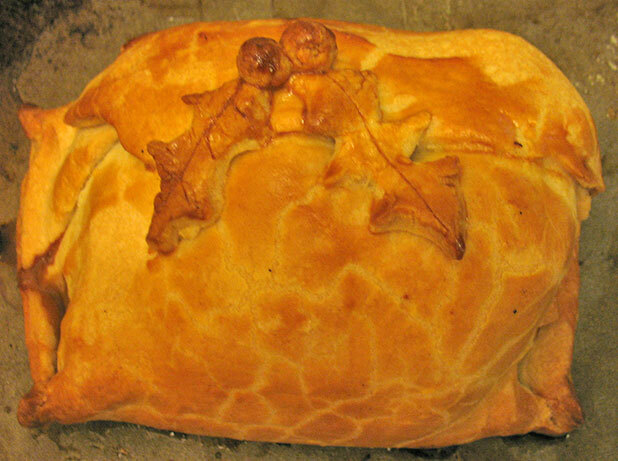 This was a good recipe and I think I will make it again, although in the future I will definitely use a whole fillet, using two individual steaks meant that it was very hard to wrap, and while cutting was easy (as you are only cutting through the pastry, not the meat) it didn’t look very appetising. Thanks to Simone for a great Daring Cooks challenge!